George was born in Batley around 1893 to Tom Lee and his wife Hannah (nee Crabtree). The couple were married at Batley Parish Church in 1889, neither Tom nor Hannah could sign their name on the marriage certificate. A daughter, Mary was born in 1890 followed by John William (1892), George, Joseph Edward (1894) and Isaac (1898). The family had moved to Hartlepool before the birth of Rose Ann in 1901. In the 1901 census they were living at 22 Edward Street, Hartlepool and Tom, born Liversedge was working as a labourer in a foundry. Martha was born in Middlesbrough in 1908 before the family moved to live in a four roomed house at 3 Shady Row, Meltham Mill, Meltham, Huddersfield Tom was working as a bobbin maker’s labourer in a cotton mill. George was also working at a bobbin mill as bounder in a bobbin shop. Hannah’s 72 year old mother, Sarah Ann Crabtree, born Batley was also living with them. Tom had signed the census form himself showing he could at least write since his marriage. On 18th February 1914 George married Agnes Dickenson at Holy Trinity , South Crosland Church . George signed his attestation papers on 19th March 1912 in Huddersfield joining the Territorials 5th Battalion West Riding Regiment. They show he was aged 19 years and 8 months, was a mill hand at a cotton mill, owned by J.Brook Bros. Meltham living at 3 Shady Row, Meltham Mills. It also tells us he was 5 feet 2 and a half inches tall, with good vision and a chest girth of 32 inches when expanded and fair physical development. On 17th March 1916 the War Office stated that any correspondence relating to George should be sent to Mrs Agnes Lee of 14 Rankroyds, Holywell Green, Halifax. The West Riding Division was a formation of the Territorial Force. It was formed as a result of the reforms of the army carried out in 1908 under the Secretary of State for War, Richard Burdon Haldane and was one of 14 Divisions of the peacetime Territorial Force. The units of the Division had just departed for annual summer camp when emergency orders recalled them to the home base. All units were mobilised for full time war service on 5th August 1914 and moved to concentrate in the South Yorkshire/ Lincolnshire area by mid August 1914. George left Folkestone on the 14th April 1915 on board the S.S. Victoria landing at Boulogne the following day. 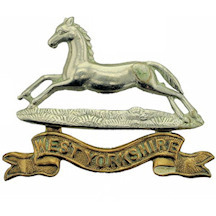 From the 15th May 1915 the formation became 146th Brigade, 49th (West Riding) Division. By 19th April the Division had concentrated on the areas between Estaires, Merville and Neuf Berquin. They fought in the Battle of Aubers Ridge on the 9th May. On 27th May 1915 George was awarded 10 days F.P. No.1 for neglect of duty when on sentry duty . Field Punishment No.1 was a humiliation. The offender was tied with arms outstretched to a cart wheel of a gun carriage for two hours at a time. The Division were fighting near the village of Boesinghe (Boezinge) which directly faced the German line across the Yser Canal. On the 1st November the 1st/5th Duke of Wellington’s War Diary says they were at Elverdinghe and there was a lot of rain. Two mules fell into a trench in the chateau grounds , in the late evening , and they had to be shot when they could not get them out after a couple of hours. On the 2nd there were the usual working parties at night. On the 3rd they were relieved at the chateau by the 8th Rifle Brigade and went into reserve at Farms, left sector. ‘A’ Company was sent to the West bank of the canal near the bridge , ‘B’ Company to the dug outs at Hulls Farm, ‘C’ Company to the dug outs at Modder Farm and Saragossa, ‘D’ Company to Pelissier Farm and Battalion Headquarters was at Malakoff Farm . They were in occupation of the farms on the 4th but on the 5th ‘B’ Company was shelled by the enemy at Hulls Farm with one casualty. Perhaps this casualty was George and it was the evening of the 4th/5th November when he was killed. George was Killed in Action on the 4th November 1915 according to CWGC and was awarded the 1915 Star, British War Medal and the Victory Medal. Bard Cottage where George was buried was a house a little set back from the line, close to a bridge called Bard’s Causeway, and the cemetery was made nearby in a sheltered position under a high bank. He is Remembered with Honour on Batley War Memorial and Carlinghow St. John’s Church.